When the first series of Telltale's The Walking Dead appeared back in 2012, it felt like the start of a renaissance of point and click style adventure games, a genre long considered a niche interest following its implosion in the late 90s. Titles like The Walking Dead emulated the earlier style but focused to a great extent on story rather than the esoteric puzzles that confused and confounded earlier games in the genre. Some would argue that over the last few years there has been an even greater shift towards storytelling, to the general detriment of interactivity. The Council takes a different approach to other recent releases. The game is certainly narrative-heavy, but the inclusion of an RPG-lite progression system and the ability to choose a skillset with which to solve the adventure's various puzzles and diplomatic interactions does indeed set it apart. The Council takes place in 1793 and follows lead character Louis de Richet, a member of a secret society, as he explores a private island. Louis has been invited to the island by a mysterious and wealthy benefactor. Also on the island are a number of important historical figures such as Napoleon and George Washington who each have their own agenda. Louis is trying to locate his mother, also a member of the same secret society, who has gone missing and was last seen on the island. Through discussion with the island's inhabitants and exploration of a large manor in the centre, Louis hopes to piece together the mystery of his mother's disappearance. In true Telltale style, the decision that the player makes will influence the development of the story. The Council is part narrative adventure and part puzzle game. Players are free to choose their preferred path as well as how they want to develop their in-game skills, which provides ample opportunity for replay to see how different actions could lead to different results. 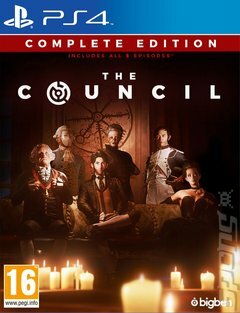 This Complete Edition includes all five episodes of The Council in one box.